We check out ASUS’ latest premium ultrabook! Those new features, combined with extremely powerful internals means that the newest ZenBook S is the most stylish, most powerful notebook that you can ever ask for. It looks crazy small and thin. That’s because it is. In person, the ZenBook S is slightly thinner than Apple’s Touchbar-equipped MacBook Pro at 12.9mm, and has approximately the same size as a sheet of A4 paper. It weighs in at about a kilo, making the ZenBook S lighter than Dell’s XPS 13 — its closest premium ultrabook rival. The ZenBook S comes with an all-aluminum build with rose gold chamfering and details around the notebook. 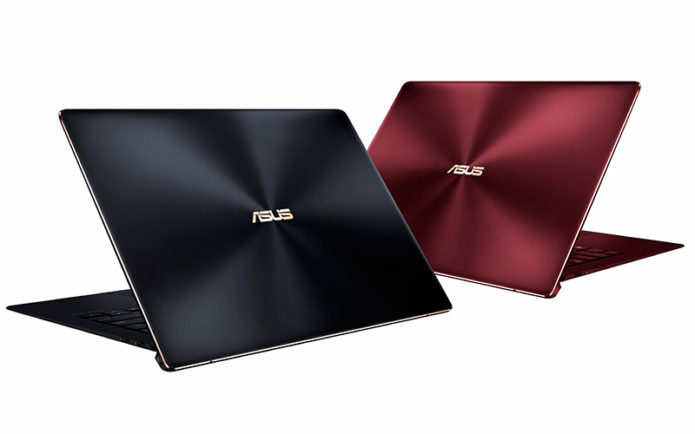 It is dressed in Deep Dive Blue, though you can order the ZenBook S in Burgundy Red. Like most ZenBooks launched this year, the ZenBook S comes with ASUS’ ErgoLift hinge, which serves two functions: it tilts the keyboard by 5.5 degrees for a comfortable typing experience and allows more air in to cool the heat generated by the components of the machine. The chiclet keys feel lower than your usual laptop keyboard but still offers the same tactile feel and key spacing of an average laptop. The trackpad houses the fingerprint scanner for secure logins. As for audio, the Harman/Kardon speakers are found at the bottom and come with a Smart Amplifier for optimal audio quality. Speaking of thermal management, you have vents at the keyboard area, right where the ErgoLift hinge is found. Inside those vents is a liquid-crystal-polymer fan impeller with 71 blades that helps the ZenBook S run cooler than previous models by almost 5°C. The ZenBook S’ diminutive size houses a 13.3-inch touchscreen display in either 4K or Full HD resolution, accompanied by ultraslim 5.9mm bezels. Even with slim bezels, you still have an HD webcam found on top of the display. Regardless of the display you choose, all ZenBook S models offer 100% sRGB gamut and 72% NTSC color gamut coverage for the best possible color accuracy. Like the MacBook Pro, the ZenBook S only has USB-C ports: two of them are Gen 2 ports that support Thunderbolt 3, and one is a Gen 1 port that supports Power Delivery. Aside from USB-C ports, you get a combo headphone jack at the ErgoLift hinge area. If you need legacy ports like USB-A, you can purchase either ASUS’ Mini Dock or Universal Dock. The former offers USB-A, USB-C, and HDMI connectivity in case you will need it, while the latter offers two USB-A ports, a USB-C port, dedicated microphone and headphone jacks, SD card reader, HDMI and VGA ports, and an Ethernet port. Under the hood, you can choose either an Intel Core i7-8550U or Intel Core i5-8250U processor paired with up to 16GB LPDDR3 RAM, up to 1TB PCIE Gen 3 x4 SSD, and Intel HD Graphics 620 shared GPU. Keeping the lights on is a non-removable 50Whrs Lithium-polymer that is rated for up to 13.5 hours on a single charge. Based on Lazada’s listing, the ZenBook S is priced at Php 84,995/$1,574. This model comes with a Core i7-8550U processor, 8GB RAM, 256GB SSD, and 4K display.